We have previously seen parents who appear less mature than their children in responding to sporting events. We would have to add a father of a student with Vancouver (Wash.) Skyview High basketball team who responded to a contentious game with a call for someone to massacre students at Camas (Wash.) High. There are calls for criminal charges and the father, who has not yet been identified, is barred from the school grounds. 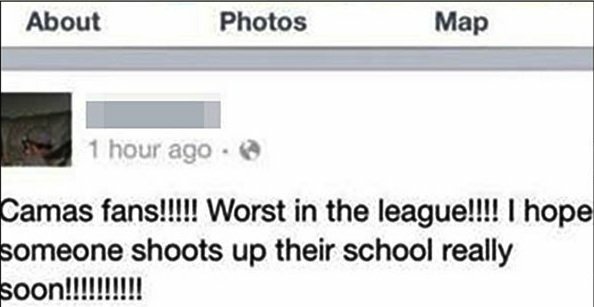 Parents were understandably a bit peeved at the suggestion of a massacre to address a basketball disagreement. Camas police have launched an investigation. The man later reportedly sent a message downplaying the comment and, while I find the comment uniquely stupid and reprehensible, I do not believe it should be treated as a criminal matter. What do you think? You are a credit to Scientology. Very droll. I laughed out loud (LOL). I needed that, first thing in the morning. “We” don’t tend to think of the Illuminati & Bilderbergers on top of it all. I infer, from your reply, that you haven’t experimented with the aluminum-foil hat. Apocryphal evidence suggests that it may be palliative. May I have another? Oh, please. You omitted wearing aluminum-foil hats. Perhaps that’s one of the real answers that CCHR provides? Citizens Commission on Human Rights is described as a Scientology front group. Here’s your reply. Pay attention & you will learn many useful things. Of course you will learn nothing if your mind is closed to learning anything. This might well be the case for you unfortunately but there are others out there that can understand logical answers that don’t follow the media spin. I’ve never worn a tin foil hat & I don’t know anyone that does; its certainly not worn by Scientologists. CCHR was indeed founded by the Church of Scientology, for itself and all mankind, there being many other groups & individuals in the crosshairs of Psychiaytry. Remember its not a help tool except for totalitarian and would be totalitarian governments as ours is trying so hard to be, while pretending not to be, under the guise of manipulated ‘democracy’. By the way, Scientology literally means the study of knowing how to know. So you can see why they might come up with answers not yet seen by others, though the CCHR membership is heavilly populated with persons of other, or no, religion, as the answers are open to all. So you could also see why the ‘keep them drugged & ignorant’ Psychiatrists would chose Scientology as an enemy. 9/11 & to a lesser extent Pearl Harbor, were inside jobs, using an enemy to turn public opinion at great cost. I’m not sure of Psychiatry’s involvement in those, if any. But certainly the Nazi Holocaust; fully admitted by German Psychiatry just last year. I’d be surprized if Jonestown wasn’t closely linked to psychiatric drugs but I have not studied it. More importantly 300 million people in the USA right now are in the crosshairs of Psychiatry. We tend to think of the Illuminati & Bilderbergers on top of it all, but if these guys are all drugged up, perhaps the tail is wagging the dog. Either way, no one needs this scum. What Bob Kauten said. The police should check on any guns in his possession.